Krui is the capital of Pesisir Barat Regency, the youngest regency in Lampung Province, Sumatra. The Krui region includes Pesisir Tengah, Karya Penggawa, South Krui and Way Krui. In addition to the Lampung tribe, Krui residents also come from Java and Bali. To go to Krui, you have several options. You can catch a plane from Radin Inten II Lampung Airport with the aim of Serai Krui Airport. There is also a flight Jakarta – Krui with transit in Lampung. Or you can depart from Lampung by bus or car. 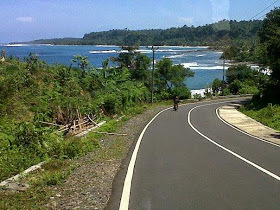 Pesisir Barat Regency has a coastal length of about 210 km. The beach that is on the north side is generally decorated with rocks while the southern one is a stretch of white sand. Krui itself has unspoiled beaches whose beauty is amazing. Let’s see the best things to do in Krui Lampung Indonesia. Tanjung Setia Beach is a major tourist attraction in Krui. This white sandy beach is famous for its good waves for surfing. Therefore many foreign tourists, including from Australia, America, Netherlands, Spain, Portugal, and South Africa, came here to surf. Compared to Bali that has been too crowded, they prefer the big waves and calm atmosphere in the Tanjung Setia Beach. The waves at Tanjung Setia Beach come from the Indian Ocean so it has a height of 6 meters with a length of nearly 200 meters. April – August is the best time to surf here. In those months the local government will hold the Tanjung Setia Festival to promote the beach as a surfing location. Besides surfing you can also fish here. The target is not the usual fish, but the awesome tuna and blue marlin. If you want to stay, around the beach there are cottages with varying prices. You can also camp on the beach to enjoy the moon and stars while accompanied by the sound of waves crashing. Tanjung Setia Beach is located in Tanjung Setia Village, Pesisir Selatan, about 30 minutes from downtown Krui. It’s free entry. You only need to pay parking fee. 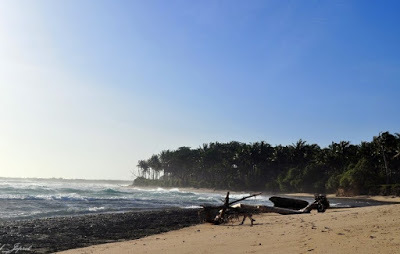 Karang Nyimbor Beach, also known as Ujung Bocor Beach, is probably not so well known by domestic tourists. But for surf enthusiasts, Karang Nyimbor Beach is in their bucket list. The waves on this beach rival the waves on Bali’s beaches. Karang Nyimbor Beach, categorized as left hander, is often visited by foreign surfers who want to try their skill in conquering the typical big wave of the Indian Ocean. In addition to watching the surfers in action, you should not miss the beautiful sunset here. Seeing the sunset on the high seas accompanied by the sea breeze is truly a memorable experience. 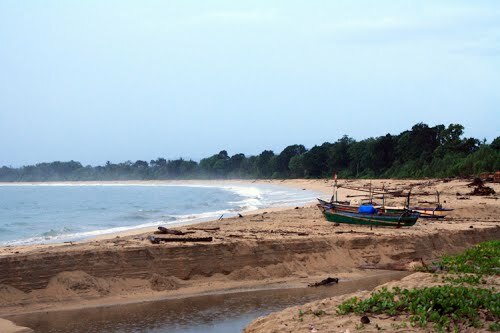 Karang Nyimbor Beach is located in Pesisir Selatan, about 30 minutes from downtown Krui. It’s free entry. When you are at Labuhan Jukung Beach, you may forget that you are not in Bali. Yes, the beauty of Labuhan Jukung Beach resembles the beauty of Bali’s beaches. The beach has a vast expanse of clean white sand, a stunning blue sea, the typical big waves of the Indian Ocean, but without crowds of visitors. When the sea recedes, you can easily catch sea animals trapped in corals such as crabs, shellfish, small fish, and even squid. Its good waves are often used by foreign tourists to surf. This area has been equipped with adequate facilities such as parking lot, restaurant, rest area and lodging. Labuhan Jukung Beach is located in Kampung Jawa Village, Pesisir Utara, about 1.5 hour from downtown Krui. It’s free entry. You only need to pay parking fee. The name of the beach is the same as the name of Bali’s beach. It’s because in this region there are many people from Bali. They came here through transmigration held by the government several decades ago. Melasti Beach is often used for religious events of the Balinese Hindu community, such as Nyepi. 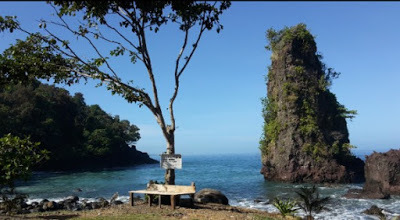 Therefore you can see the temple of Tirta Bhuana at Melasti Beach. Melasti Beach has soft brown sand, a refreshing sea breeze and big waves. Visitors are not allowed to swim at the beach because the waves are considered dangerous. Nevertheless, enjoying the peaceful atmosphere of the beach is enough to calm your mind. Melasti Beach is located in Pekon Marang Village, Pesisir Selatan, about 30 km from downtown Krui. It’s free entry. Way Jambu Beach is located between Tanjung Setia Beach and Karang Nyimbor Beach. The beach is just 11 km from Tanjung Setia Beach. Like its neighbors, the beach also has a natural beauty. The clean beaches, the refreshing breeze of the ocean, the rolling waves, and the serene atmosphere will make you happy to linger here. Fishing and sunset viewing is a must-do activity at Way Jambu Beach. As for surfing, not many surfers do it here. 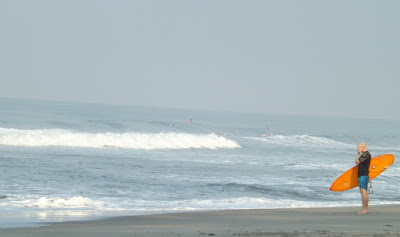 The surfers prefer surf at Tanjung Setia Beach or Karang Nyimbor Beach. 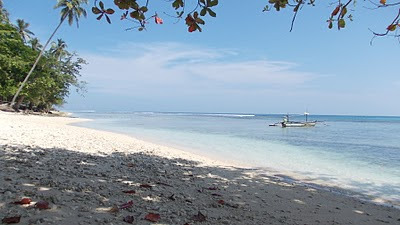 Way Jambu Beach is located in Way Jambu Village, Pesisir Selatan. It’s free entry. Batu Tihang Beach is an instagramable spot in Pesisir Barat Regency. You can see on the beach there is a big stone standing upright like a pole. That’s why the beach is called Batu Tihang (pole stone) by the local people. 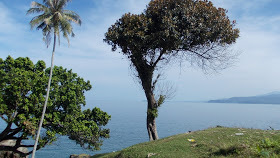 Batu Tihang Beach is situated on Krui – Bengkulu road. Because of that many bikers or car drivers usually take a stop here. They take a break while enjoying the panoramic view of the beach. Batu Tihang Beach is also often used as the location of prewedding photos. Batu Tihang Beach is located in Kota Karang Village, Pesisir Utara, about 1.5 hour from downtown Krui. It’s free entry. Well, let’s explore more things to do in Krui Lampung Indonesia! Mandiri Beach, which has blackish brown sand, is the only beach in Krui whose waves break in the sand, or in surfing terms is a beach break. Many foreign surfers love this wave. Not far from Mandiri Beach you can see there are inns that become their base camp while visiting here. Mandiri Beach has an unspoiled beauty. Its location is far from the settlement which allows you to enjoy the beach with more private. Walking down the beach or watching golden sunset while accompanied by the sound of waves can make you relax and happy. Mandiri Beach is located in Mandiri Heni Village, Pesisir Selatan, about 11 km from downtown Krui. It’s free entry. Banana Island, which is located in the middle of the Indian Ocean, is the outermost part of Pesisir Barat Regency. It is said that this island, when viewed from the air, is shaped like a banana. Banana Island has a beautiful beach. The soft white sand and rows of coconut trees will welcome when you set foot here. From Banana Island you can see the Sumatra Island with its stunning mountain range. 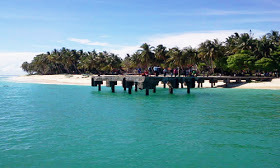 Banana Island has an unspoiled beauty. There are no cars here, just motorcycles. Its electricity comes from the generator. To see the whole of Banana Island, which covers 148.82 hectares, you can climb to the Tower of Rambu Suara which has a height of about 30 meters. In the afternoon make sure you are in Batu Liang, the best spot on Banana Island to see the sunset. If you want to stay, there are houses that are functioned as a simple lodging with rates ranging from Rp 100,000 – 350,000 / night. To go to Banana Island you can depart from Kuala Stabas Pier or Tembakak Pier. Every morning there are boats that go to Banana Island. If departing from Kuala Stabas Pier, the ticket is Rp 20,000 and the journey takes 1 hour. If departing from Tembakak Pier, the ticket is Rp 15,000 and the journey takes 20 minutes. Or you can rent a boat at a cost of Rp 500,000 for a return trip. If lucky, on the way to Pisang Island you can see the dolphins. Selalau Hill was once an icon of Krui City, when surfing has not become a pop culture. The hill, which is situated beside the Kuala Stabas Pier, has a breathtaking view. From Selalau Hill you can see Labuhan Jukung Beach with its beautiful white sand, the Krui City with all its hustle and bustle, the towering mountains of Sumatra, the vast blue sea, the sailing fisherman and the sturdy Banana Island in the midst of the waves. As dusk turns night, you will be amazed to watch the beauty of the sun that is set at the end of the horizon. Selalau Hill is located in Pasar Krui Village, Pesisir Tengah. Way Pemerihan is an elephant patrol post in Bukit Barisan National Park. The elephants here are well trained and accustomed to human presence. They help the rangers to patrol to prevent illegal activities in Bukit Barisan National Park. 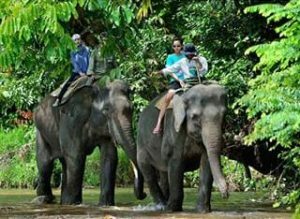 In Way Pemerihan you can ride elephants down the river and forest, bathe the elephants in the river, and feed the elephants. What a great things to do in Krui Lampung Indonesia! This place used to be a rescue center of a rhino. That’s why this place is called Rhino Camp. But now this place is converted into a simple lodging for tourists who want to travel in Bukit Barisan Selatan National Park. Accompanied by a forest ranger, from here you can explore the forest to see wildlife such as birds, elephants, Sumatran tigers, Sumatran rabbits, gibbons, mouse deer and many more. 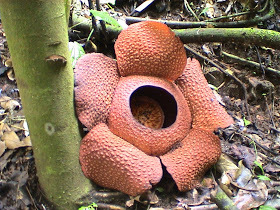 If you come at the right moment, you can see the amazing Raflesia Arnoldi when it is in bloom. 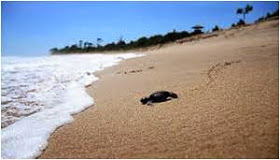 Muara Tembulih Beach is a landing site for green turtles, leatherback turtles, hawksbill and lekang turtles. If you come between February and July, if lucky you can see turtles laying on this beach. Do not see them too close. Turtles are very sensitive to light and noise. If disturbed, it will cancel its intention to lay eggs and will move. You should never take the turtle eggs. FYI, of the 100 hatching eggs, only 1 survived. In Muara Tembulih there is a building that was once used as a turtle breeding. It is unknown why the breeding stopped operating. Muara Tembulih Beach is located in Muara Tembulih Village, Ngambur, about 59 km from downtown Krui. Matu Cave is believed by local people to be inhabited by supernatural beings. It is said that the supernatural beings used to ask the victim on the West Cross road connecting Lampung with Pesisir Barat Regency. After the traditional elders performed rituals to honor the supernatural beings, no more casualties were heard on the West Cross road. Apart from the myth, Matu Cave has its own charm. Matu Cave overlooks the sea. Therefore, the path to the cave can only be passed when the sea is receding. The entrance of the cave is triangular. From here you can feel a strong mystical aura, you can even smell the odor of incense from inside the cave. The lighting in the cave comes only from the sunlight coming through the mouth of the cave. Be polite while in the cave. Please note that thousands of bats are also nested in this cave. 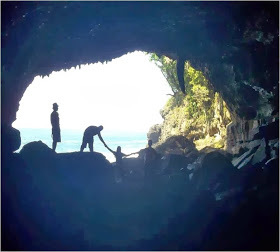 Matu Cave is located in Way Sindi Village, Karya Penggawa, about 11 km from downtown Krui. It’s free entry. Ok guys, now you know the best things to do in Krui Lampung Indonesia. No doubt Krui has the best Places To Visit in Indonesia with its beautiful nature. Let’s visit Krui Lampung Indonesia!